Booties have been a fall staple since I don't know when and there's always a couple pairs that everybody clambers after once the leaves start turning. 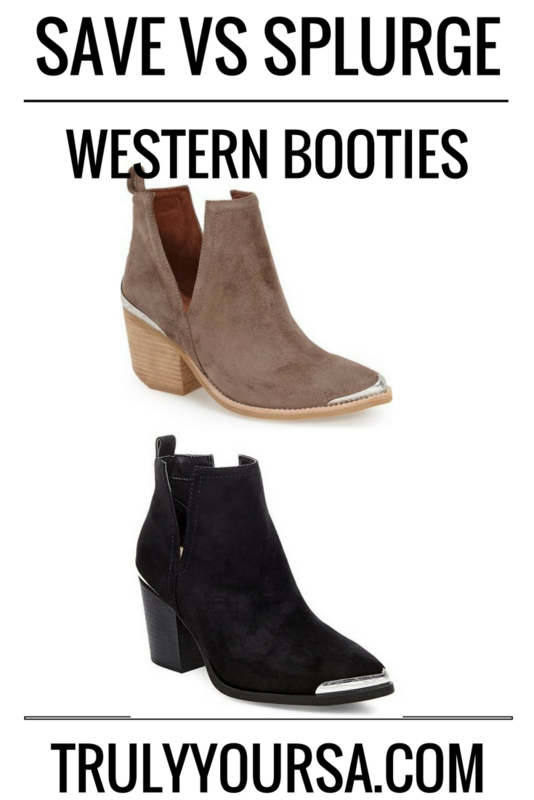 This year I've noticed that peep toe and western-style booties are on everyone's wishlist (mine included!). I've already scored a pair of amazing peep toe booties and I couldn't wait to find an equally great pair of western booties. I stumbled across a pair of western-style booties from Jeffrey Campbell and instantly fell in love. The color, the detailing, the material - they were everything I had been searching for! 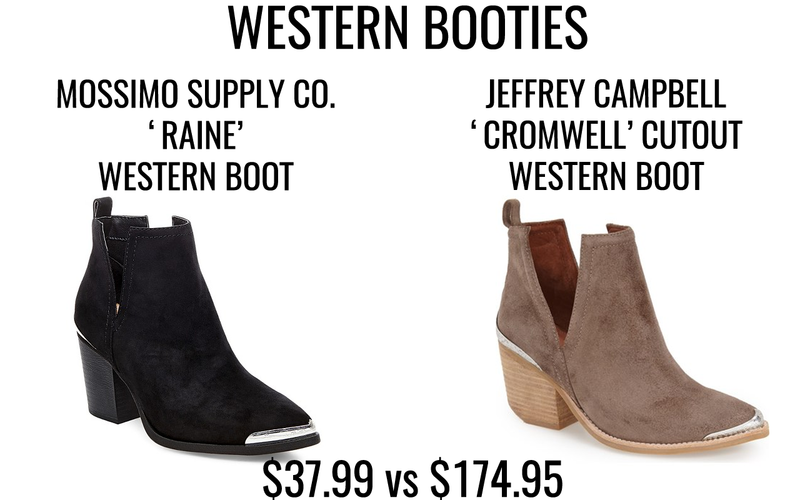 I was not in love with the price tag though and I was lucky enough to come across a similar, but less expensive, pair of Mossimo Supply Co. western booties on Instagram and I feel even more in love. Side-by-side I honestly can't tell which is which! 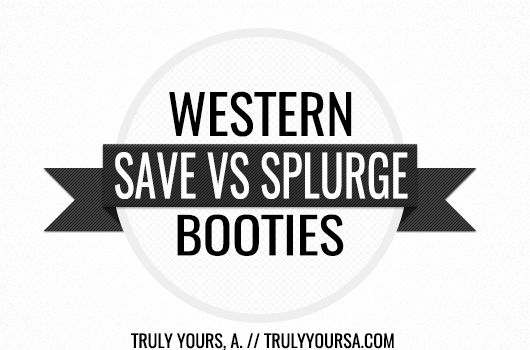 If you're looking to snag a pair of western booties for yourself and can't decide whether you should save or splurge keep reading! I've read reviews for both booties about the sizing. The Jeffrey Campbell booties do run true to size (TTS), but the Mossimo Supply Co. booties run small especially at the top where you slide your feet in. You can tell by the picture above that the slit cutout is a little bit wider on the Cromwell boot and much smaller on the Raine boot. I would definitely suggest trying the Raine booties on in store if possible. If they're not available near you order at least one size up to be safe! Overall, both pairs of booties are a must-have for this fall. The metal detailing on the toe and heel give these boots flair and make them perfect for dressing up or down! I definitely plan on picking up a pair of the Mossimo Supply Co. booties (and soon because these babies are running out quickly!). The Jeffrey Campbell pair will definitely last a bit longer due to the higher quality materials that are used, but if I know myself I'll only end up wearing these a couple times before retiring them. Are you planning on picking up a pair of these beautiful booties for fall? Let me know in the comments below!